I have been using my trusty old C11 that I normally use for the Moon and planets to take some deep sky objects. The C11 gets used more this time of the year because it is ‘Galaxy Season’. This means that the Milky Way is not dominating the sky to us here at this time of the year as it is during the Summer months when it stretches across the sky, and that means that we can more easily see out of our galaxy to other distant galaxies without the plane of the Milky Way getting in the way. This galaxy is often referred to a the Cigar Galaxy. It is Messier 82 and it is often shown together with M81, Bode’s Galaxy, but the field of view with the C11 and my ATIK 383L CCD will not fit them both in the FOV at the same time. 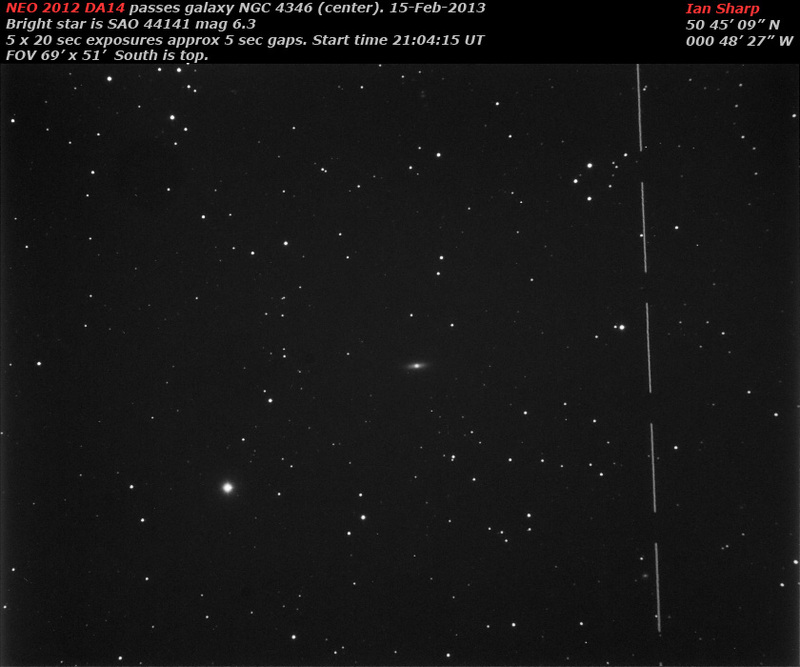 This means we can zoom in on M82 which is only about 11 arc minutes across. M82 is a bit of a strange galaxy to look at. It is a ‘starburst’ galaxy, seen edge-on and is also the closest starburst galaxy to the Milky Way. 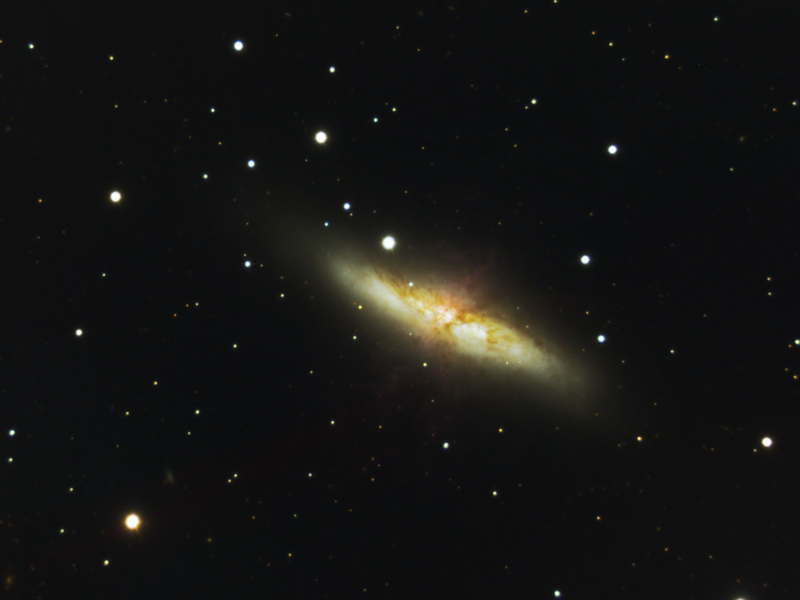 As a starburst galaxy M82 has a rate of star formation 10 times greater than our galaxy. Conditions for the starburst activity were believed triggered by a past close encounter with M81 between 300 and 600 million years ago which must caused gas and dust to be compressed into conditions favourable for star formation. I’ve been testing a new planetary camera: the QHY5L-II. 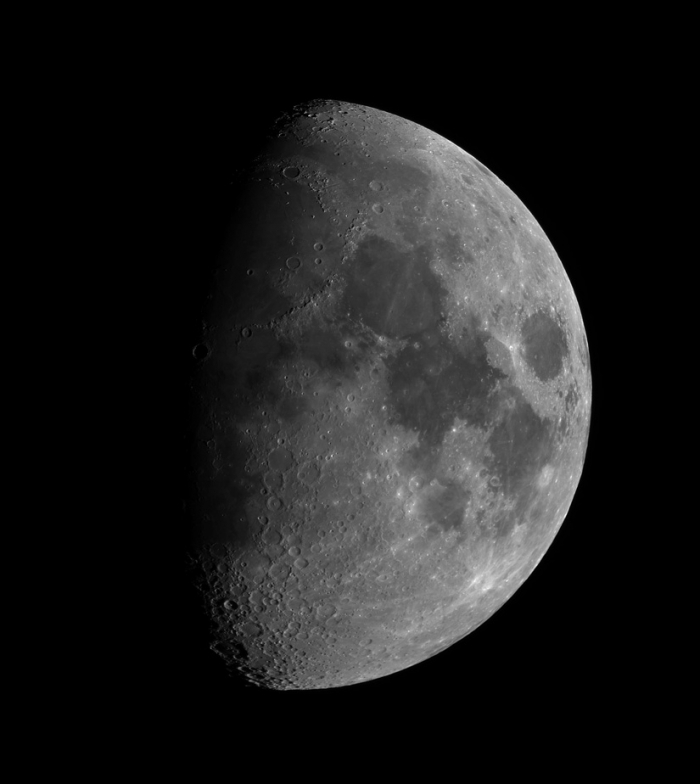 Two nights ago, I partnered it with my recently acquired 130mm APO to produce this mosaic of the Moon. This mosaic consists of 8 images which have been ‘stitched’ together in Photoshop. Each image was taken at the prime focus of the F/7 Refracting telescope with the camera taking images at 15 fps (frames per second) at 1280 x 960 pixels. Make sure you show the image at its full size, as your browser will make it fit to your screen to start with. The image below is a very small representation of the full thing! A Close Encounter of the Rocky Kind! 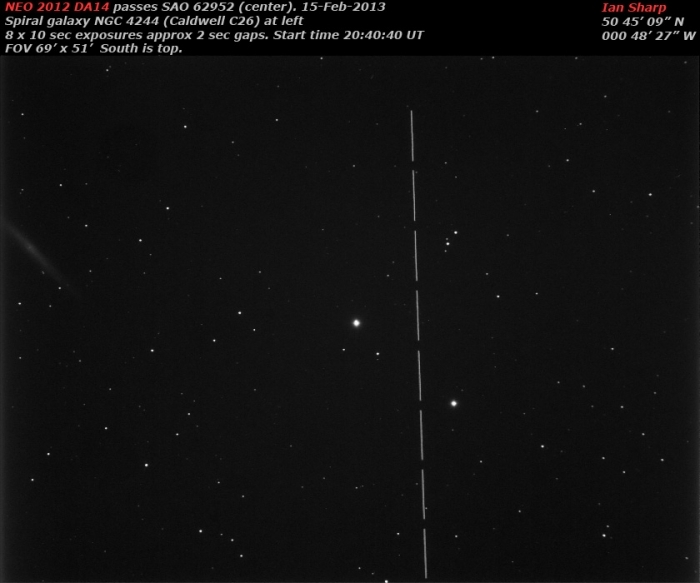 Near Earth Asteroids Comments Off on A Close Encounter of the Rocky Kind! There was a lot of media coverage of this event, much increased by the incredible Russian Meteorite fall. The Near-Earth Asteroid NEO 2012 DA14 made a very close pass to the Earth yesterday (15-Feb 2013). Incredibly, this football-pitch-sized rock passed about 28,000 Km from Earth. Think about that! The diameter of our planet is about 12,750 Km and the Earth-Moon distance is, on average, 384,400 Km. So, this rock skimmed by only two-and-a-bit Earth diameters away! Anyway, I was determined to grab some images of this event, and luckily it was a lovely clear sky that greeted me as I opened the observatory to prepare at sunset. I had prepared by downloading the orbital elements from the IAU Minor PLanet Center here http://www.minorplanetcenter.net/ , but picking it up was still tricky as it was not in the field of my 130mm APO refractor as expected. Undeterred, I scanned each side of the track and luckily spotted the tell-tail streak of the rapidly moving object on my screen. Here are 2 images with full details on each. I chose these out of the many I took because they have nice galaxies in them too!